Proverbs 1–9: "Proverbs of Solomon, Son of David, King of Israel"
Proverbs 10–22:16: "Proverbs of Solomon"
Proverbs 22:17–24:22: "The Sayings of the Wise"
Proverbs 24:23–34: "These Also are Sayings of the Wise"
Proverbs 25–29: "These are Other Proverbs of Solomon that the Officials of King Hezekiah of Judah Copied"
Proverbs 30: "The Words of Agur"
Proverbs 31:1–9: "The Words of King Lemuel of Massa, Which his Mother Taught Him"
Proverbs 31:10–31: the ideal wise woman (elsewhere called the "woman of substance"). "Proverbs" translates the Hebrew word mashal, but "mashal" has a wider range of meaning than the short catchy sayings implied by the English word. Thus, while roughly half the book is made up of "sayings" of this type, the other half is made up of longer poetic units of various types. These include "instructions" formulated as advice from a teacher or parent addressed to a student or child, dramatic personifications of both Wisdom and Folly, and the "words of the wise" sayings, longer than the Solomonic "sayings" but shorter and more diverse than the "instructions". The first section (chapters 1–9) consists of an initial invitation to young men to take up the course of wisdom, ten "instructions", and five poems on personified Woman Wisdom. Proverbs 10:1–22:16, with 375 sayings, consists of two parts, the first contrasting the wise man and the fool (or the righteous and the wicked), the second addressing wise and foolish speech. Chapters 25–29, attributed to editorial activity of "the men of Hezekiah," contrasts the just and the wicked and broaches the topic of rich and poor. Chapter 30:1–4, the "sayings of Agur", introduces creation, divine power, and human ignorance. It is impossible to offer precise dates for the sayings in Proverbs, a "collection of collections" relating to a pattern of life which lasted for more than a millennium. The phrase conventionally used for the title is taken from chapter 1:1, mishley shelomoh, Proverbs of Solomon (the phrase is repeated at 10:1 and 25:1), is likely more concerned with labeling the material than ascribing authorship. The book is an anthology made up of six discrete units. The first, chapters 1–9, was probably the last to be composed, in the Persian or Hellenistic periods. 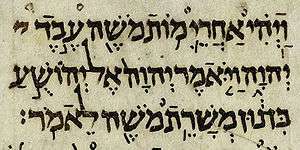 This section has parallels to prior cuneiform writings.The second, chapters 10–22:16, carries the superscription "the proverbs of Solomon", which may have encouraged its inclusion in the Hebrew canon. The third unit is headed "bend your ear and hear the words of the wise": a large part of it is a recasting of a second-millennium BCE Egyptian work, the Instruction of Amenemope, and may have reached the Hebrew author(s) through an Aramaic translation. Chapter 24:23 begins a new section and source with the declaration, "these too are from the wise." The next section at chapter 25:1 has a superscription to the effect that the following proverbs were transcribed "by the men of Hezekiah", indicating at face value that they were collected in the reign of Hezekiah in the late 8th century BCE. Chapters 30 and 31 (the "words of Agur," the "words of Lemuel," and the description of the ideal woman) are a set of appendices, quite different in style and emphasis from the previous chapters. The "wisdom" genre was widespread throughout the ancient Near East, and reading Proverbs alongside the examples recovered from Egypt and Mesopotamia reveals the common ground shared by international wisdom. The wisdom literature of Israel may have been developed in the family, the royal court, and houses of learning and instruction; nevertheless, the overwhelming impression is of instruction within the family in small villages. Along with the other examples of the Biblical wisdom tradition – Job and Ecclesiastes and some other writings – Proverbs raises questions of values, moral behavior, the meaning of human life, and righteous conduct. The three retain an ongoing relevance for both religious and secular readers, Job and Ecclesiastes through the boldness of their dissent from received tradition, Proverbs in its worldliness and satiric shrewdness. 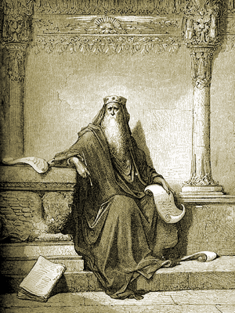 Wisdom is as close as Biblical literature comes to Greek philosophy, of which it was a contemporary; it shares with the Greeks an inquiry into values and reflections on the human condition, although there is no discussion of ontology, epistemology, metaphysics, and the other abstract issues raised by the Greeks. Proverbs was almost excluded from the Bible because of its seeming contradictions – the reader is told, for example, both to "not answer a fool according to his folly", according to 26:4, and to "answer a fool according to his folly", as 26:5 advises. 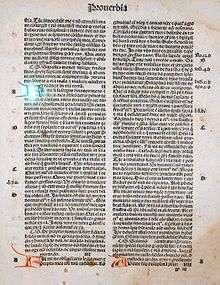 More pervasively, the recurring theme of the initial unit (chapters 1–9) is that the fear of the Lord is the beginning of wisdom, but the following units are much less theological, presenting wisdom as a transmissible human craft, until with 30:1–14, the "words of Agur," we return once more to the idea that God alone possesses wisdom. The contradictions are the result of the book's origins as not just an anthology but an anthology of anthologies. "The fear of God is the beginning of wisdom" (Proverbs 9:10 – the phrase implies submission to God's will). Wisdom is praised for her role in creation ("God by wisdom founded the earth; by understanding he established the heavens" – Proverbs 3:19). God acquired her before all else, and through her he gave order to chaos ("When [God] established the heavens...when he drew a circle on then face of the Deeps...when he marked out the foundations of the earth, then I was beside him" – Proverbs 8:27–31). Since humans have life and prosperity by conforming to the order of creation, seeking wisdom is the essence and goal of the religious life. Wisdom, or the wise person, is compared and contrasted with foolishness or the fool, meaning one who is lacking in wisdom and uninterested in instruction, not one who is merely silly or playful (though see the words of Agur for a "fool" who has wisdom, and could be seen as playful). For the most part Proverbs offers a simplistic view of life with few grey areas: life lived according to the rules brings reward, life in violation of them is certain to bring disaster. In contrast, Job and Ecclesiastes appear to be direct contradictions of the simplicities of Proverbs, each in its own way all but dismissing the assumptions of the "wise". Noteworthy also is the fact that the "mighty acts of God" (the Exodus, the giving of the Torah at Sinai, the Covenant between God and Israel, etc.) which make up Israel's history are completely or almost completely absent from Proverbs and the other Wisdom books: in contrast to the other books of the Hebrew bible, which appeal to divine revelation for their authority ("Thus says the Lord! "), wisdom appeals to human reason and observation. The pre-Exilic (i.e. pre-586 BCE) Old Testament allowed no equals to YHWH in heaven, despite the continued existence of an assembly of subordinate servant-deities. The post-Exilic writers of the Wisdom tradition developed the idea that Wisdom existed before creation and was used by God to create the universe: "Present from the beginning, Wisdom assumes the role of master builder while God establishes the heavens, restricts the chaotic waters, and shapes the mountains and fields." Borrowing ideas from Greek philosophers who held that reason bound the universe together, the Wisdom tradition taught that God's Wisdom, Word and Spirit were the ground of cosmic unity. Christianity in turn adopted these ideas and applied them to Jesus: the Epistle to the Colossians calls Jesus "...image of the invisible God, first-born of all creation...", while the Gospel of John identifies him with the creative word ("In the beginning was the Word, and the Word was with God, and the Word was God"). In the 4th century, when Christianity was caught up in heresies and still developing the creeds which would define its beliefs, Proverbs 8:22 was used both to support and refute the claims of the Arians. The Arians, assuming that Christ could be equated with the "Wisdom of God" (1 Corinthians 1:24), argued that the Son, like Wisdom, was "created" (Proverbs 8:22), and therefore subordinate to the Creator; their opponents, who argued that the relevant Hebrew word should be translated as "begot", won the debate, and the Nicene Creed declared that the Son was "begotten, not made", meaning that God and Christ were consubstantial. "As a dog returns to his vomit, so a fool repeats his folly"
↑ Berlin 2011, p. 588. 1 2 Clements 2003, p. 438. 1 2 Alter 2010, p. xiii–xvii. 1 2 Longman & Garland 2009. 1 2 Boccaccini 2002, p. 106. ↑ Perdue 2012, p. x–xi. ↑ Farmer 1991, p. 17-20. ↑ Perdue 2007, p. 48. ↑ Perdue 2007, p. 58. ↑ Perdue 2007, p. 67. ↑ Perdue 2007, p. 68. ↑ Farmer 1991, p. 25. ↑ Rogers, Robert William (1912). "8. Fragment of Wisdom Literature". Cuneiform parallels to the Old Testament (1st ed.). New York: Eaton and Mains. Retrieved March 13, 2016. 1 2 Alter 2010, p. 183-185. ↑ Smothers 2000, p. 167-168,174. ↑ Tucker 2000, p. 163-166. ↑ Crenshaw 2000, p. 217. ↑ Keown 2000, p. 183. ↑ Farmer 1998, p. 130. ↑ Page Lee 1990, p. 176-177. ↑ Berlin 2011, p. 188. ↑ Parrish 1990, p. 183. ↑ Kaiser 1997, p. 28. ↑ Parrish 1990, p. 183-184. ↑ Farmer 1991, p. 53-54. Alter, Robert (2010). The Wisdom Books: Job, Proverbs, and Ecclesiastes: A Translation with Commentary. W. W. Norton & Company. Berlin, Adele (2011). "Cosmology and creation". In Berlin, Adele; Grossman, Maxine. The Oxford Dictionary of the Jewish Religion. Oxford University Press. Boccaccini, Gabriele (2002). Roots of Rabbinic Judaism: An Intellectual History, from Ezekiel to Daniel. Eerdmans. Clements, Ronald E. (2003). "Proverbs". In Dunn, James D. G.; Rogerson, John William. Eerdmans Commentary on the Bible. Eerdmans. Crenshaw, James (2000). "Unresolved Issues in the Wisdom Literature". In Tate, Marvin E.; Ballard, Harold Wayne; Tucker, W. Dennis. An Introduction to Wisdom Literature and the Psalms. Mercer University Press. Farmer, Kathleen A. (1991). Who knows what is good? : a commentary on the Books of Proverbs and Ecclesiastes. Wm. B. Eerdmans Publishing. Farmer, Kathleen A. (1998). "The Wisdom Books". In McKenzie, Steven L.; Graham, Matt Patrick. The Hebrew Bible Today: An Introduction to Critical Issues. Westminster John Knox Press. Fox, Michael V. (2000). Proverbs 1–9. Fox, Michael V. (2009). Proverbs 10–31. Yale University Press. Grabbe, Lester L. (2006). A History of the Jews and Judaism in the Second Temple Period (vol. 1): The Persian Period (539-331BCE). Continuum. Kaiser, Christopher B. (1997). Creational theology and the history of physical science. Brill. Keown, Gerald (2000). "The Canonical Shape of the Wisdom Literature". In Tate, Marvin E.; Ballard, Harold Wayne; Tucker, W. Dennis. An Introduction to Wisdom Literature and the Psalms. Mercer University Press. Longman, Tremper; Garland, David E. (2009). Proverbs—Isaiah. Zondervan. Page Lee, H. (1990). "Council, Heavenly". In Watson E. Mills (General Editor). Mercer Dictionary of the Bible. Mercer University Press. Parrish, V. Steven (1990). "Creation". In Watson E. Mills (General Editor). Mercer Dictionary of the Bible. Mercer University Press. Perdue, Leo G. (2007). Wisdom Literature: A Theological History. Presbyterian Publishing. Perdue, Leo G. (2012). Proverbs. Westminster John Knox Press. Sinnott, Alice M. (2005). The Personification of Wisdom. Ashgate Publishing. Smothers, Thomas (2000). "Biblical Wisdom in its Ancient Middle Eastern Context". In Tate, Marvin E.; Ballard, Harold Wayne; Tucker, W. Dennis. An Introduction to Wisdom Literature and the Psalms. Mercer University Press. Tucker, W. Dennis (2000). "Literary Forms in the Wisdom Literature". In Tate, Marvin E.; Ballard, Harold Wayne; Tucker, W. Dennis. An Introduction to Wisdom Literature and the Psalms. Mercer University Press. Waltke, Bruce (2004). Book Of Proverbs: Chapters 1–15. Wm. B. Eerdmans. ISBN 978-0-8028-2545-2. Waltke, Bruce (2005). The Book of Proverbs: Chapters 15–31. Wm. B. Eerdmans. ISBN 978-0-8028-2776-0. Wikimedia Commons has media related to Book of Proverbs.